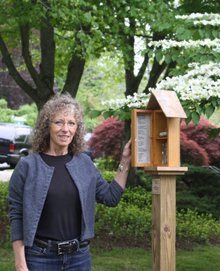 On June 15, eleven poetry boxes were installed throughout the town of Mystic for the Poetry of the Wild / Mystic Installation. This will be the last stop of Poetry of the Wild in its tour through southeastern Connecticut. The Mystic installation features entirely the voices of local poets; many of the makers of the boxes also did their own poems, included is a prolific young poet, Lucy Turner. Lucy is only ten years old and one of triplets. Seeking out the poetry boxes will encourage walkers to explore the town inside and out, seeing it through the perspectives of poets and artists who know it intimately. Along the way, one will discover favorite local haunts: the Bank Square Bookstore, the popular ice cream store on the bridge, a river walk behind the Mystic Museum of Art, the Mystic Seaport, as well as refuges just outside the town limits. These refuges include: The Peace Sanctuary, overlooking the Mystic River, the Dennison Homestead, and Haley Farm. The installation will continue through August 30. for For more information call the Mystic Museum of Art at: 860. 536.7601 or visit https://www.facebook.com/PoetryoftheWild.